A pizza for Lent: curly endive or escarole? The last day of Carnival, as everyone knows, is called Mardi Gras or also Fat Tuesday. That day the lunch is particularly substantial: it starts with lasagna, then it continues with pork chops combined with a genuine Gragnano red wine; and lastly, as a dessert we eat Mardi Gras fritters, the black pudding and migliaccio (Neapolitan semolina cake), which are typical Carnival-time sweets. To finish the lunch, we drink a walnut liqueur with an alcohol content of 53%. Lent begins the next day and this year it ends on March 29th. In fact, I’ve put on La Notizia pizzerias’ menus a light and tasty pizza that represents, however, a true penance to gluttony. I thought of using the endive, a vegetable that, in Naples, is prepared in various ways. There are different varieties of escarole, which is called cichorium endivia. The most used ones in the Neapolitan gastronomic tradition are the curly endive and the escaroles which are prepared in many ways. The book “Del cibo pitagorico ovvero erbaceo per uso de’ nobili, e de letterati” (Phytagorean food or rather herb-based, for the use of the nobles and cultured) by Vincenzo Corrado, published in 1781, was the first text to describe the curly endive. Corrado wrote: “L’indivia è un’erba buoniffima per cibo, la quale è di varie pfecie, ma la più ftimata è quella ch’è bianca, e nel mezzo dimolte foglie folte e riccie” (the endive is a really good herb, of which there are different varieties, but the most appreciated one is that white and it is the middle of many curly and thick leaves) and he passed down some recipes. 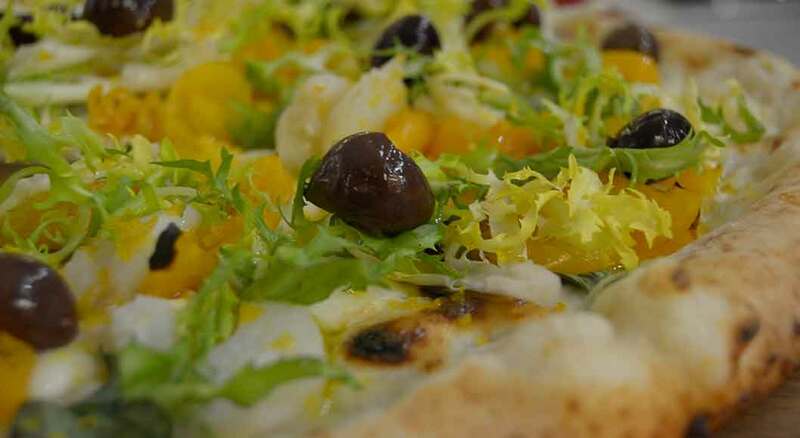 While this is my recipe for the pizza: yellow piennolo tomatoes, black olives, smoked mozzarella, salted codfish cut into very thin stripes and previously desalted, put raw and then baked. When the pizza comes out of the oven it is added the finely chopped curly endive, bottarga, a drizzle of extra virgin olive oil and a pinch of salt on the tomatoes. A great to see and delicate to eat pizza. The endive is so important in the Neapolitan gastronomic culture that we find it also in the famous song Michelemmà, composed in the 1600s and republished in the 1700s in a collection by Salvator Rosa that says “È nata mmiez’o mare, Michelemmà, Michelemmà, oje na scarola” (she was born in the middle of the sea, Michelemmà, Michelemmà, an endive). Actually, we are in a sea of penitence for gluttony in the middle of Lent.